All it needs is a little help from oil and gas prices, while making a bit of headway on its debt. As 2015 draws to a close, Chesapeake Energy's (NYSE:CHK) stock sits 77.5% below the price at which it started the year. It's a slide that has largely been fueled by the continued slide of oil and gas prices. 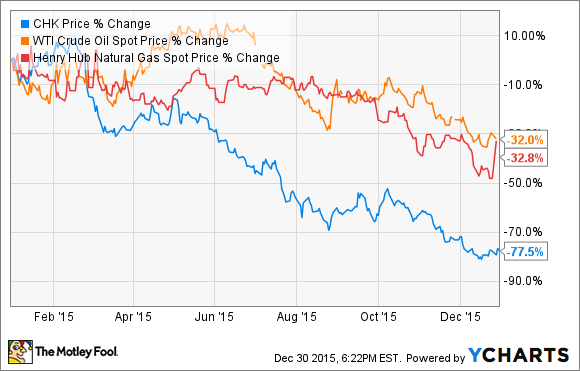 Oil and gas prices weren't the only weight pushing the company's stock price lower this year. Chesapeake's leverage surged higher after the company spent nearly $4 billion to drill oil and gas wells this year, many of which weren't needed given the persistent glut of oil. Worse yet, much of that spending was paid for not from operational cash flow, but from cash on its balance sheet, which led to a significant rise in its net debt. However, while weakening commodity prices and growing leverage were a weight on the company's stock price in 2015, the stock could soar if those weights are lifted in 2016. In fact, it's not beyond the realm of possibility that the stock could double next year, especially given the fact that the stock would simply bounce back up to the price at which it was trading just this past October. 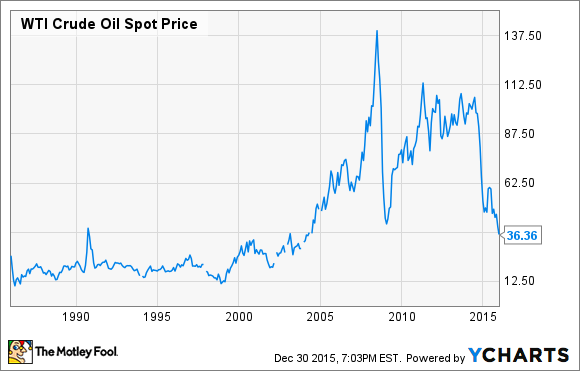 Oil and gas prices have fallen lower than anyone ever expected. In fact, the drop in oil during the past 18 months has been its worst performance during the same time frame since the 1986 crash. There's reason to believe that history could repeat itself, once again. U.S. oil production has already started to decline due to an underinvestment in the number of wells that need to be drilled to maintain production. Further, global oil demand continues to grow. At some point, these two factors will begin to eat into the glut of oil currently in storage, which should lead to a recovery in the oil price. That's not to say that oil won't continue to slide until that happens, but the potential does remain for oil prices to begin to recover in 2016. The general consensus among analysts is that oil will average around $50 per barrel next year, which is about where it was when Chesapeake Energy's stock was double where it is now. 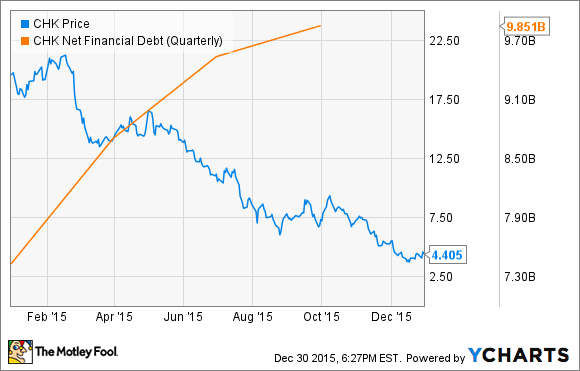 Given where oil and gas prices are right now, Chesapeake Energy's debt is at unsustainable levels. This is what has analysts wondering out loud not if, but when, the company will default on its debt. That's due to a growing concern that the company won't be able to roll over its near-term debt maturities when they comes due during the next few years. These worries have pushed the company's stock down to levels that would imply that it's not going to make it. However, while the risk is very real that Chesapeake Energy could end up going bankrupt, that's not a forgone conclusion for a number of reasons. The company has no debt maturities until 2017, which gives it some more time to address those maturities before they really become an issue. It even recently hired an advisor to help it to restructure its debt. Further, while Chesapeake burned through more than $2 billion in cash this year, it still has roughly $1.75 billion of cash on its balance sheet. If it can get its spending under control next year by cutting its capex plan to match its cash flow, the company will be able to put that cash position toward debt reduction. Finally, despite weak commodity prices, the company has a number of very valuable assets that could be sold. One asset, in particular, is its position in the STACK play of Oklahoma. The company has called this position "one of the most undervalued assets in our portfolio." It's a play that has a lot of value to the industry because the drilling returns are still pretty good, even at current commodity prices. Rival Devon Energy (NYSE:DVN), for example, recently spent $1.9 billion to bulk up its acreage position. Devon Energy did so because the company it bought was earning a 40% rate of return on new wells at a $40 oil price. Chesapeake Energy could cash in on an asset such as this in order to reduce its debt, which would alleviate some of the pressure on its balance sheet. While these are very challenging times for Chesapeake Energy, it's not dead just yet. A rally in the price of oil, along with the company making some headway on its debt, could catapult its stock back to the level it was at just a couple of months ago -- which is double where the stock is trading today. If commodity prices continue to weaken and the company continues to burn through cash, the stock price could just as easily continue to crater.